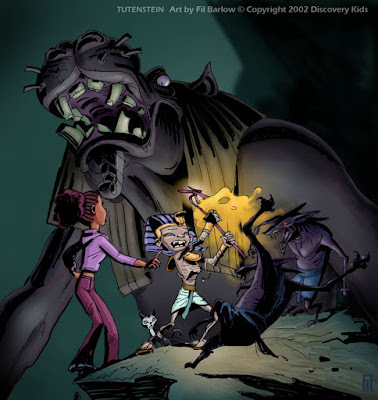 Self-proclaimed history nerd Jay Stephens was inspired by a visit to the traveling King Tut exhibit in Canada to develop one of his future comic creations: Tutenstein; a portmanteau of Tutankhamun and Frankenstein. 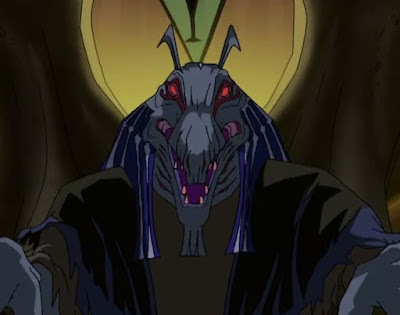 Tutenstein made his debut in 1997’s Land of Nod #3 by Black Eye Productions and was subsequently featured in several of Stephens’ following publications. Discovery Communications, looking for content to draw in their desired demographic to their Discovery Kids channel, approached Stephens about adapting Tutenstein into an animated series to accompany their other animated offering, Kenny the Shark. Both shows gave a focus to topics Discovery often aired specials on. Luxor, Cleo and Tut, falling to pieces. Tutenstein followed the adventures of the 10-year old Tut Ankh En Set Amun (Jeannie Elias, Maryke Hendrikse & Donna Cherry) who had become the pharaoh of ancient Egypt and wielder of the Scepter of Was. When his sarcophagus ended up in the museum where archeology enthusiast Cleo Carter (named after Cleopatra, voiced by Crystal Scales & Leah Lynette) often hung out, he became revived when lightning struck the staff. It also gave Cleo’s cat, Luxor (David Lodge), the ability to speak and a desire to serve Tut. Tut, being 10 and a former ruler, acted about as bratty as could be expected; often using magical scrolls to cast spells for his own self-gain that often backfired. Tut was also put at odds with various ancient gods who could be just as arrogant and petty as he; in particular the god of chaos, Set (Lodge), who wanted to claim the Scepter of Was and free himself from his underworld prison. Professor Horace Behedty (named for the god Horus, voiced by Lex Lang as Vince del Castillo) was the museum’s curator and believed he was the smartest in the room, always looking to get more publicity for himself (and sometimes the museum). Walter Jacobs was the museum’s underpaid and dimwitted security guard, often tasked by Behedty to perform jobs not really in his function. Dr. Roxanne Vanderwheele was the professor’s colleague and a bit more open-minded and up-to-date in her approach to archaeology. Stephens had very little input on the show beyond being a creative consultant. Character designer Fil Barlow was responsible for most of the character and set designs. In fact, it was one of Barlow’s pitch pieces that prompted Discovery to finally move forward on the series. Egyptologist Kasia Szpakowska provided reference material for Barlow to work off of in order to get the designs to feel as authentic as possible. Barlow’s designs also led to the running gag of Tut’s body parts either falling off or becoming separated from his body somehow. After Barlow’s 20-episode contract expired, he was fired and replaced by his student, Thomas Perkins, for the remainder of the series. Set. And he looked like such a friendly guy. 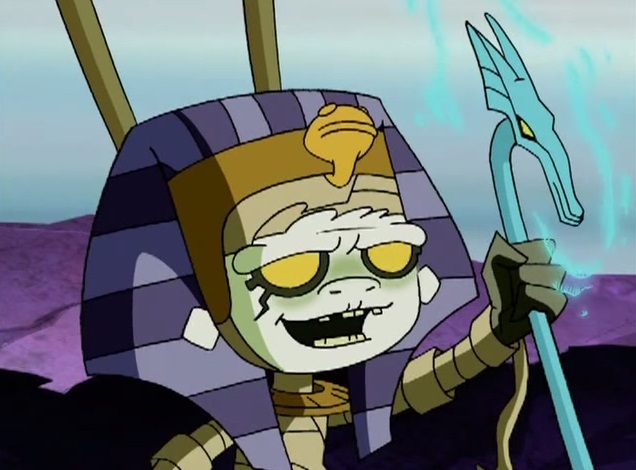 Tutenstein debuted simultaneously on Discovery Kids and their programming block on NBC on November 1, 2003. Writers on the series included John Behnke, Rob Humphrey, Brooks Wachtel, Cynthia Harrison, Charlotte Fullerton, Scott D. Peterson, Tim Cahill, Kevin Campbell, Julie McNally Cahill, Michael Merton and Philip Morton. With Spzakowska and Karen Hill-Scott, Ed.D. serving as the educational consultants, each episode was able to inject a little factuality into its comedic approach. The ancient gods, for example, were largely accurate to the Egyptian depictions of them. The show was animated by NIC Entertainment Inc. with music by Guy Michelmore. Tutenstein ran for three seasons, concluding with the film Clash of the Pharaohs. The series was nominated for three and won two Emmy Awards in 2004, 2006 and 2007. In 2004, Marvel Comics published a promotional comic in association with Discovery Kids that saw Tut and friends meeting up with Spider-Man and some of the X-Men as they banded together to thwart Set’s latest scheme. In 2007, Discovery Kids released three DVD collections containing four episodes apiece, along with games and documentaries as special features. “The Awakening” (11/1/03) – Cleo Carter brings Tut back to life and Luxor gains the ability to speak. “The Curse of the Pharaoh” (11/8/03) – El Zabkar summons Ammut, the devourer of the hearts of the dead, to go after Tut. “Clash of the Shadbitis” (11/15/03) – Tut’s being lazy and sending shabitis to help Cleo do chores causes things to go out of control. “I Did It My Way” (11/22/03) – Disliking the modern world, Tut changes everything into ancient Egypt. “The Boat of Millions of Years” (12/6/03) – Tut asks Ra to delay the sunrise so he can watch movies late, but Ra ends up in trouble and time stops. “The Powerful One” (1/3/04) – Tut’s anger over not getting his own pyramid causes Hathor, the goddess of love, to be summoned and transformed into Sekhmet, the goddess of war. “There’s Something About Natasha” (1/10/04) – Tut falls for Cleo’s friend Natasha and has a love spell put on her, but the spell goes horribly wrong. “The King of Memphis” (1/17/04) – While visiting Memphis, Tut is split into three copies of himself that he must reunite by sunset. “Roommates” (1/24/04) – Tut moves in with Cleo and constantly annoys her, on top of cheating her out of her stuff. “Ghostbusted” (1/31/04) – The goddess Isis summons the ghost of one of Tut’s friends to punish him after he cheats her in a game. “Near Dead Experience” (2/21/04) – Fearing Cleo might die of bronchitis, Tut wants his doctor, Imhotep, to preserve her like he was. “The Unsafety Zone” (2/28/04) – Tut breaks the alarm that disturbed his slumber, allowing two thieves to escape. “Happy Coronation Day, Tutenstein” (3/6/04) – Cleo throws Tut a party to honor the good deeds he’s done, but a slave of Set crashes it and steals something from him. “Old Man Tut” (9/4/04) – Tut breaks his ankh so that he can become older—unfortunately, the process doesn’t stop. “Cleo’s Catastrophe” (9/11/04) – Tut accidentally causes Cleo and Luxor to switch bodies. “The Shadow Gobbler” (9/25/04) – When Tut separates himself from his shadow, he allows a shadow demon from the underworld to come to Earth and devour shadows. “Tut Jr.” (10/2/04) – Tut loses Cleo’s little cousin in the underworld. “Something Sphinx” (10/9/04) – Tut’s new servant makes Luxor feel left out. “The Supreme Tut” (10/16/04) – Tut becomes a god. 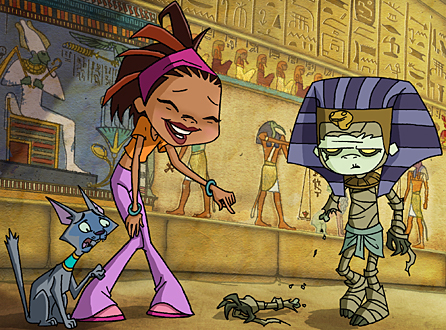 “The Day of the Undead” (10/30/04) – Tut joins Cleo and her friends for Halloween and summons a demon from the underworld to scare them. “Friends” (11/27/04) – Tut befriends a couple of delinquents and starts causing mischief. “Green-Eyed Mummy” (12/4/04) – Tut sends the new mammoth exhibit to the underworld. “Queen for a Day” (1/15/05) – Cleo takes Tut’s place when he’s kidnapped to the underworld. “Procras-Tut-Nation” (10/1/05) – Having fun on Cleo’s skateboard may cause Tut to miss the Sed Festival in the underworld. “Behdety Late Than Never” (10/22/05) – When Behdety calls in someone to help save the museum money, he ends up being a thief that frames Behdety for his crimes. “Walter the Brain” (11/19/05) – Tut makes Walter smarter, and Thoth believes Walter is the one who cast the spell. “The Comeback Kid” (9/9/06) – Tut uses a spell that makes him human again, but also brings a dinosaur back to life. “Rest in Pieces” (9/12/06) – Tut separates his body parts to multitask, but they end up getting dispersed. “Irresistible You” (9/13/06) – Tut tries to use a love spell to foil Cleo’s rival, but it backfires. “Sleepless in Sarcophagus” (9/14/06) – Tut gets a snake to help him sleep, but doesn’t know a demon is actually possessing it. “The Truth Hurts” (9/16/06) – Tut ends up cut-off after he insults some of the ancient gods. “Was Not Was” (9/23/06) – Tut ends up losing his scepter. “Tut the Defender” (10/14/06) – Tut brings two Vikings back to life to fight. “Spells and Sleepovers” (10/28/06) – Tut disguises himself as a girl so he can attend Cleo’s sleepover. “Fearless” (10/29/06) – Tut’s attempt to prove himself fearless causes him to leave a portal to the underworld open, allowing a demon to escape. “UnPharaoh” (11/25/06) – A bracelet possesses Dr. Vanderwhelle and leads him to try and prove Tut was no longer a pharoh. “Tut’s Little Problem” (12/2/06) – Using a size-changing scroll results in Tut becoming tiny. “Into the Past” (10/9/06) – Cleo goes back to ancient Egypt to find out what happened to her father. “Keep Your Wandering Eye to Yourself” (1/13/07) – Jealous of Cleo’s outside life, Tut plans to spy on her. “Clash of the Pharaohs” (10/11/08) – Nightmares about his death prompts Tut to take a trip back in time and Cleo ends up being mistakenly crowned as a pharaoh. Originally published in 2017. Updated in 2018.